TopOCR Reader is less than 12 inches tall and weighs less than a pound. It is completely silent in operation, and it takes up about as much desk space as a coffee cup. Despite its small size, the 8.0 MP camera can scan a full A4 or Letter sized document and create a 300 DPI image in a fraction of a second! Because of its advanced electronic, mechanical, optical and software design, TopOCR Reader doesn't require ANY manual adjustment! All of TopOCR Reader's camera controls are automatically adjusted to the ambient lighting by the camera's built-in image procesing chip. This built-in automatic control system gets rid of all of the guesswork it normally takes for using a camera for document scanning! The image processing hardware also provides real-time MJPEG image compression, assuring high frame rate, low lag video transfer. TopOCR Reader is built to be tough and durable, so you can easily fold it and toss it in your gym bag and take it with you without any worries, and since it's powered directly through a USB port, you also never have to worry about batteries or how to transfer images to your PC! It's all glass optics and high-end 8.0 MP image sensor combine excellent sharpness and a large depth of field, and because it has no moving parts, is also much more reliable than an auto-focus lens. TopOCR Reader also includes a built-in USB powered LED lamp for low light environments with a simple touch control. TopOCR Reader is the ONLY document camera that is powered by TopOCR, proven to be the most accurate OCR software for Document Cameras. TopOCR combines sophisticated real-time image processing with three specialized OCR Engines together with an easy to use Image Editor and Word Processor/Spell Checker. It also provides a single-click Real-Time Document Camera Image Preview and Capture Dialog that makes document positioning a snap! With TopOCR you never have to worry if your documents are placed upside down or sideways. It automatically transforms images to the correct text reading orientation for every scan. TopOCR's OCR text output can be saved in your choice of PDF/HTML/TXT/RTF file formats and it also has a multilingual Text To Speech System allowing you to convert your documents into high quality speech and save them as MP3 files. TopOCR's Neural Warp is a revolutionary new convolutional neural network architecture that can analyze a document's page layout and can correct for page curvature and other geometric image distortions. For those who have difficulty reading printed material, TopOCR has a powerful, easy to use, multi-lingual Accessible OCR User Interface. This interface provides a very easy to learn Visually Accessible User Interface for Document Cameras..
TopOCR Reader includes a flexible neoprene image positioning pad. The light side of the pad has small tactile markers etched into the document and camera placement outlines. This will enable positioning the camera and document for proper alignment entirely by touch or visually. Wrapping your TopOCR Reader in the neoprene image positioning pad is also an ideal way to pack your TopOCR Reader for safe transport. Why not use a Digital Camera or Smartphone? When used for document image reading, handheld digital cameras or smartphones will often show a characteristic motion-blur casued by a slight shaking of the camera while the camera's shutter is open. This effect is even more pronounced at lower shutter speeds required in low light settings. TopOCR Reader's integrated camera stand with its weighted base adds mechanical stability to the camera to completely eliminate camera motion-blur. 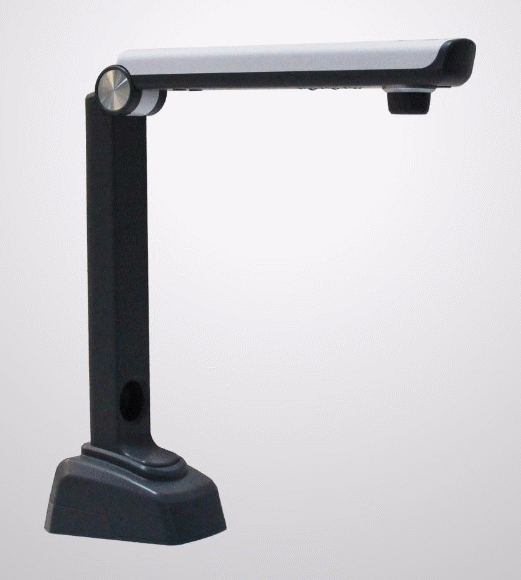 The integrated camera stand also guarantees that the camera is always perpendicular to the document to be read as well as at the correct height above the document. This approach completely eliminates image distortion and focus issues. This also allows you to use your hands for other things besides holding a camera! With TopOCR Reader you can use your hands to hold documents flat for better image capture and they can be automatically cropped from the image along with the background. © 2018 TopSoft, Inc. All rights reserved.